This morning we attended an event known as Abushibare. Here's a favorite photo. The Priestess, also known as a Noro, had finished prayers and offerings at a shrine. 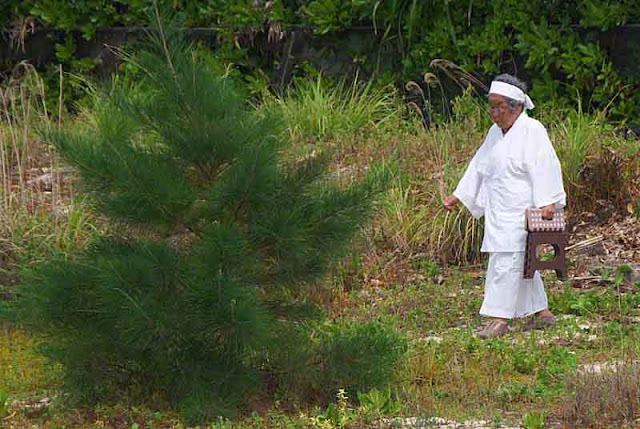 Here, she is walking towards the shoreline, where more rituals will be performed. With the possibility of the full moon, peeking through the cloudy skies, I'm in a rush. So, the other 150 images taken today, will be waiting in the pending files. That way, batteries get charged and, I'll do some recharging in my sleeping bag.